You Save: $11.83 (79%) Ships in 1 day. Soft Cover, 240 pages, 7 x 10. 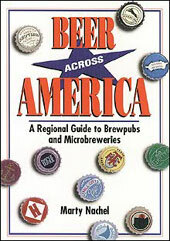 Inspired by the beer-of-the-month club that bears its name, the Beer Across America guide directs you to more than 400 brewpubs and microbreweries nationwide. Covering the country in four geographical regions -- Pacific, Mountain/High Plains, Central, Atlantic -- the guide puts the names, addresses, phone numbers, and hours of operations and tours, where available, right at your fingertips. Fifty in-depth profiles introduce you to some of America's most successful -- and unusual -- brewers, brewpubs, and microbreweries and highlights their styles, marketing techniques, logos, and more.